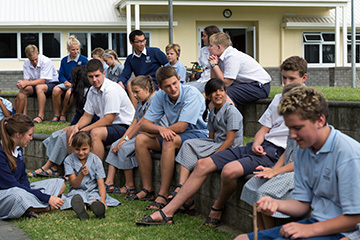 Bethlehem College is an integrated, co-educational Christian School catering for 1500 students across Years 1 – 13. It is governed by a Board of Trustees representing both parents and proprietors. The College is committed to developing a Biblically based Christ-centered educational community. Here students can find a place that encourages a commitment to a personal faith in Jesus Christ; a strong work ethic; involvement in a wide range of school and community activities; and a life of service and leadership. You will notice that the school is structured around achieving the goals of our mission statement with an emphasis on a curriculum which encompasses academics, sport and performing arts, a focus on teaching and learning as the key tools which help us achieve our mission, pastoral care and counselling as we seek to support parents in growing the whole person and service and leadership training as we aim to equip young people for a life of serving leadership. If you are considering a school for your child, please consider Bethlehem College if you believe that the commitment we have to the Christian faith and the emphases you see reflected here, are in line with the aspirations you have for your children. Designed and Powered by Think Marketing © 2014 Christian Education Trust | Biblically Based Education.